Last fall, Migdalia got a call that her beloved grandson, Jean Ramos, was in a terrible car accident while driving thought Fayetteville, North Carolina. He sustained a severe brain injury and was in a coma for the first 20 days after the accident. Right after the accident, Migdalia hopped onto a plane from Cidra, Puerto Rico and has been at Jean’s bedside ever since. Migdalia has been a guest at SECU Family House on and off since that awful day. Her day typically begins in our kitchen where she can often be found emptying the dishwashers and cleaning the kitchen before having breakfast with her many, newfound friends. 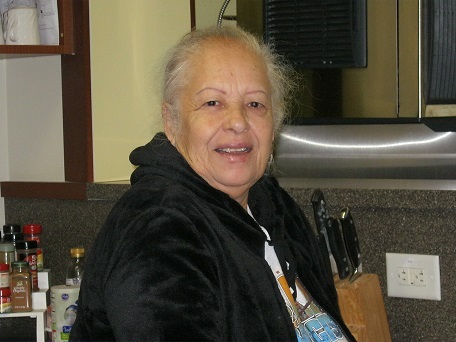 Asked what she likes most about staying at Family House, Migdalia shares through an interpreter, who also happens to be our Supervising Housekeeper, Sandra DeLeon, “I like everything here. I like the people. Everyone pays attention to my needs. Everyone is good here.” As cold weather came, she didn’t have a coat to keep her warm on her trips to and from UNC Hospitals. Upon learning this, Janice Ross, our Director of House Operations, found a coat for her within minutes. “Everyone is so nice here. That’s why I like to help out by keeping the kitchen clean,” Migdalia says. Jean is making a remarkable recovery and will be discharged soon. He’ll return home to Puerto Rico with his grandmother. As Migdalia tells us, she has everything she needs at Family house. Yet we know she’ll soon have what she’s wanted most all along: for her beloved grandson to come home.